Where on Earth have all the greasy pies, congealed hot-pots and limp ham salads gone? Well, good riddance! The gastro-pub is born. Glasgow's pubs and bars have been tickling our taste-buds for decades now with fine food that most bistros would be proud to serve. Pride in local ingredients and a good slosh of imagination from our chefs means you will be dribbling down your chin just reading down the menu. Why cook when you can now pop down "the local" for pan-seared scallops with black-pudding in a berry jus, served with an ice-cool glass of something on the side? 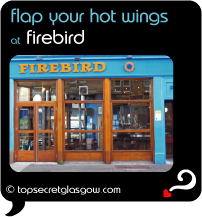 Firebird flaps its wings for attention, using Glasgow’s only wood burning stove to serve up well prepared European dishes; a gastro-pub delight. Great news! Finding this page means you can now join our VIP list for EAT Gastro-Pub. Time to grab your very own page for EAT Gastro-Pub. Do you have a special story about a time you decided to EAT Gastro-Pub? A funny experience? A grand occasion? A funky photo? A personal tip? A top secret?